I guess this is an old one now, dating back to 2007, but I hadn't seen it before. 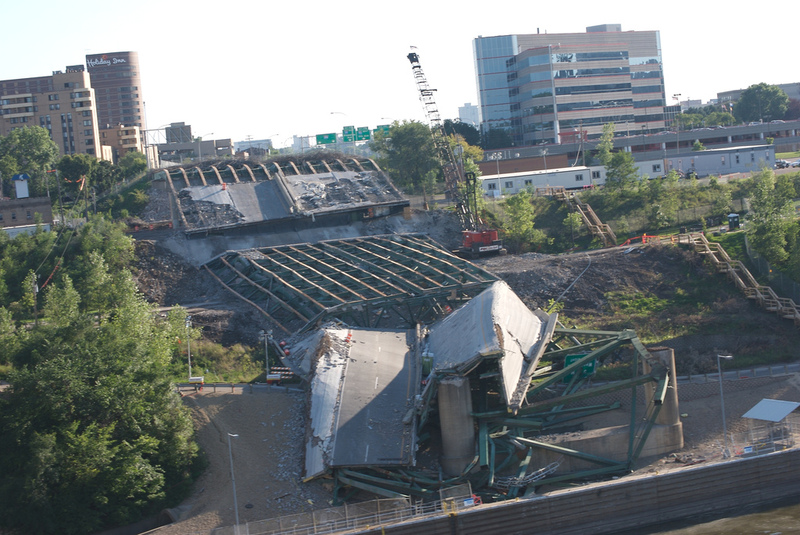 Shortly after the collapse of the I-35W Mississippi River Bridge in August 2007 (pictured right, courtesy of pmarkham), Stephen Wolfram published a blog post titled "The space of all possible bridge shapes", wondering whether new developments in science could have anything to offer to bridge designers and hence help prevent future disasters. In order to come up with designs which maximise robustness while minimising economy, Wolfram speculates that designers will need to find entirely new structural forms, which may look nothing like those that have emerged from engineering history. Wolfram is the developer of the popular Mathematica software, and a researcher into computational systems such as cellular automata. The best known of such systems is perhaps John Conway's Game of Life (pictured left, courtesy of kieff at Wikipedia), which demonstrates in a very graphic way how a wide spectrum of behaviour both random and structured can emerge from applying simple rules to the on/off state of image pixels. Genetic algorithms can be used to mutate the results, compare them against various tests, and "evolve" the system over many generations in search of some desired optimum. I have seen some experimental use of genetic algorithm techniques by architects in building design, but in structural engineering it seems to be largely confined to the academics (one of many examples here). Wolfram's main interest is in the ability of very simple systems to be processed and combined by simple rules to create highly complex outcomes. The range of possible outcomes forms a kind of computational landscape, which can be investigated to determine whether there are useful results other than those that might have initially been predicted. Some of this is explored in Wolfram's book, A New Kind of Science. Most of the famous truss types (Warren, Pratt, Howe, Fink etc) arose through a process not dissimilar to natural selection: inventors of truss forms were competing in terms of strength, ease of construction, and economy, and simple economics meant that only the fittest survived. It would be interesting to trace the history of the metal truss bridge through some kind of developmental tree, complete with extinctions, hybridisation etc. Wolfram's proposition is that a wide range of otherwise unpredictable variations in form can be readily generated by combinations of simple rules e.g. add a brace, subtract a brace, subdivide a bay, shorten, lengthen, rotate. It is therefore straightforward to generate a multi-dimensional "design space" containing a myriad of options which a rational designer would never consider. The question is then whether any better designs exist within the space of possible bridge shapes, and Wolfram's experience in other areas makes him believe quite strongly that they would. His other work also suggests they may look like nothing we have seen before, possible quite "random" in appearance. This post is getting quite long, so I'll continue this tomorrow. HP, I like this post. This seems like evolutionary biology. If I understand it engineers were once involved in an "arms Race" or on a evolutionary path to new designs? But we settled on some early winners and stopped looking? That's an interesting point. In evolutionary biology, there is not tendency to evolve towards an optimum, merely towards a solution which can out-compete within a specific ecological niche. I guess the same happened on railway bridges: Warren and Pratt trusses out-competed everything else, and competition since then has failed to "evolve" anything better. In natural selection, fresh mutations must rely on the biological scaffolding that previously existed, but are otherwise unpredictable. In engineering, mutations are consciously chosen based on logical consideration of the problem - closer to the artificial selection of dog-breeding, perhaps. Wolfram's point is that this may mean there are better solutions out there, but they have not been found because they are not an "evolutionary" development from what we already have, but something unpredictable. There is however the possibility that, as in biology, where the laws of physics impose a limit which means (for example) that elephants can't jump, the range of possible engineering solutions is similarly limited. If it's limited enough, we may already have explored all the worthwhile solutions, in which case Wolfram's idea becomes irrelevant.